The Service Broker External Activator (SBEA) allows one to launch any command-line program asynchronously using T-SQL. I haven’t found many complete end-to-end examples on how to create an SBEA application so this article will demonstrate with a common use-case; launch a SSIS package on demand with the DTEXEC command-line utility. The package can be run on any machine with SBEA and SSIS installed, which allows you to run the package remotely on a different server if you so desire. The latest version of the tool, officially named Microsoft® SQL Server® Service Broker External Activator for Microsoft® SQL Server® 2012, is a free download (http://www.microsoft.com/en-us/download/details.aspx?id=29065). Service Broker External Activator is also included in the SQL Server 2008 and SQL Server 2008 R2 Feature Packs. SBEA runs as a Windows service and leverages the SQL Server Service Broker event notification infrastructure to run a command-line application upon receipt of an event notification message. When an event notification message is received, it launches the command-line program associated with the queue identified in the notification event message. There is some learning curve if you are not already familiar with Service Broker and event notification concepts but it is a worthwhile investment, not just for SBEA, but for any application that needs asynchronous or message-based processing. SBEA is an alternative to over other methods that can launch an external program via T-SQL, such as xp_cmdshell, a SQL Agent Job (sp_start_job) or a custom SQLCLR proc. The xp_cmdshell extended stored procedure allows any ad-hoc command to be run on the database server, limited only by SQL Server service or proxy account permissions. You need to be mindful of the security implications and take precautions to ensure it can be used only in the way intended. Also, xp_cmdshell runs the launched program synchronously so the calling application must wait for the application to finish. You could take special measures to emulate asynchronous behavior with xp_cmdshell but that’s a kludge at best. A SQL Agent job allows you to run a command asynchronously but the limitation is only one instance of a job to run at a time. In contrast, SBEA allows one to run multiple application instances concurrently and does so automatically. SBEA allows a configurable maximum number of application instances so that you can scale automatically to meet peak demands. SQL Server 2012 introduces the SSISDB catalog, which provides stored procedures to run SSIS packages asynchronously via T-SQL. However, packages must be stored in the SSISDB database in order to use this feature. SBEA is an alternative if you are pre SQL Server 2012, need to run packages not stored in the SSIS catalog, or need to run command-line programs besides DTEXEC.EXE. As with all Service Broker applications, the minimal database objects needed are an initiator service and queue as well as a target service and queue. These are used to pass messages to and from the target application (SSIS package in this case). Additionally, the SBEA needs a notification service, notification queue and event notification so that it is notified when messages are waiting in the target queue for processing. Stored procedures are a great way to encapsulate Service Broker functionality and implementation details so I use procs here as the application database interface. Stored procs also simply security since the only database permissions necessary are execute permissions on the procs. Within the procs, I also log to a table to facilitate monitoring progress, troubleshooting and auditing. The complete T-SQL script is included at the end of this article. Below is the example I use for this sample with the relevant values in bold. As a side note, SBEA currently supports only one notification service even though the parent element name (NotificationServiceList) implies one can have many. However, I haven’t personally run into a case where this is an issue since, in a distributed environment, one can designate a single database for the SBEA messaging infrastructure. When the SBEA service starts, it validates the application service list against Service Broker meta-data to ensure the specified services and queues exist and are properly associated. Then SBEA starts monitoring the notification queue associated with the specified notification service. When a queue notification event message is received, it matches the server, database, schema and queue contained in the message payload against the application services listed. When matched, it launches the command-line application associated with that service. A warning message () is logged if a queue notification message is received that doesn’t have a corresponding application. SBEA logs trace messages to a file named EATrace.log in the Log folder (C:\Program Files\Service Broker\External Activator\Log). Logging levels are configurable. I suggest you start with verbose logging initially (as in the same config) and adjust to less logging once your application is stable. I included the config schema reference and various logging options as comments in the sampe config for your convenience. Be aware that trace messages are appended to the file so you’ll want to periodically delete (or archive) the file. There are a many different patterns one can generally employ with Service Broker bi-directional message processing. Here, I use a single-message-per-conversation pattern to pass parameters needed by the package as well-formed XML. The target (SSIS package) does its work and ends its side of the conversation upon completion, indicating success or failure on the END CONVERSATION statement, which generates an EndDialog or Error message that is returned via the initiator queue. Service Broker automatically executes the initiator queue activated proc when a message is waiting on the queue. Acting on behalf of the initiating application, which might not be running due to asynchronous execution of the package, the activated proc ends the other side of the conversation upon receipt of the EndDialog or Error message. Both sides of the conversation are ended, a best practice with this single-message-per-conversation pattern. Initiating application executes dbo.usp_LaunchBatchProcess to launch console application. Proc executes BEGIN DIALOG and SEND to insert the parameter message into the target queue. The console application executes dbo.usp_GetBatchProcessParameters to get parameter values. Proc executes RECEIVE of message from target queue and logs the message. The console application executes dbo.usp_CompleteBatchProcess at completion. Proc executes END CONVERSATION to signal successful completion (or END CONVERSATION WITH ERROR to indicate an error occurred). Service Broker launches activated stored procedure dbo.usp_LogBatchProcessResult in response to the EndDialog message. Proc execute RECEIVE from initiator queue and logs the result to a table. 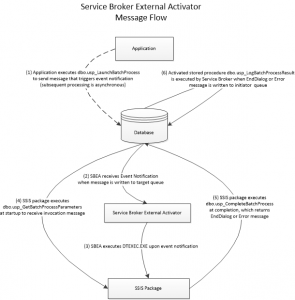 The Service Broker External Activator is a powerful way to launch command-line programs asynchronously. There is a learning curve, which can be steep if you know nothing about the SQL Server Service Broker feature. But I hope this doesn’t discourage you from exploring and using SBEA. It may be the right tool for the job in cases where you need asynchronous batch processing, avoiding custom programming or kludge design. It’s always a good thing to have another tool in your toolbox. This entry was posted in Service Broker by Dan Guzman. Bookmark the permalink.